Jerusalem artichokes and leeks are both excellent winter vegetables, standing through the worst of the weather to be dug as and when needed. At this time of year, the leeks are at the end of their useful life and will soon put forth a flower spike, and the artichokes are growing again. A couple of weeks ago we dug over the artichoke bed, selecting tubers for replanting, and using the last of the harvest for soup and the gratin described here. The gratin is prepared much as one would for potatoes, flavouring with garlic and nutmeg and cooking in a little cream. I also add some cheese to this recipe, but this can be omitted if preferred. The result is an ideal accompaniment to meat dishes and a pleasant change from potatoes. 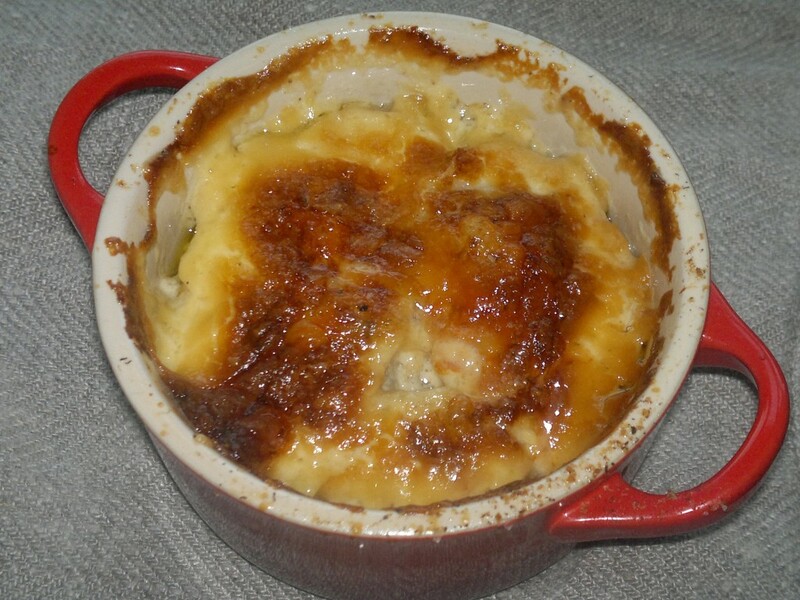 The gratin can be prepared in one dish, or in small individual pots, as we have done here. Scrub and peel the artichokes, placing in a bowl of acidulated water to prevent discolouration. Wash and trim the leeks. Cut in half lengthways, then slice finely. Add a splash of oil and the butter to a pan and gently sauté the leeks for five minutes or so until soft but not browned. Add the garlic and cook for a further minute or two, then remove from the heat. Butter an oven proof dish or individual pots. Finely slice the artichokes and layer in the dish or pots with the leeks, seasoning each layer generously with salt, freshly ground black pepper, and plenty of grated nutmeg. Add the cream and top with the cheese. Bake at 160°C for 60 to 90 minutes until the artichokes are cooked through. This entry was posted in Garden diary, Recipes and tagged Jerusalem artichoke, leeks on April 27, 2015 by JV.